Interim Man Utd boss Ole Gunnar Solskjaer has provided an injury update on his squad, and is hopeful of a huge boost ahead of Sunday’s clash with Arsenal. The Red Devils have continued their fine form under the Norwegian tactician despite their recent injury crisis, with a number of key individuals sidelined. Despite that, they remain in fourth place in the Premier League table, have advanced to the quarter-finals of the FA Cup and kept their hopes of winning the Champions League alive with a thrilling comeback against PSG in midweek. Eric Bailly limped off in that encounter, but Solskjaer has told the media that he will be fine for the weekend, as will Anthony Martial. Further though, the Man Utd boss even suggested that both Nemanja Matic and Ander Herrera could be in contention too as he welcomes back decisive figures to help maintain their impressive form. “Eric’s fine. Anthony will be available and hopefully we’ll have Nemanja and/or Ander ready as well, so looking better for it they just need to have another couple of days training with the team, they’ve done their recovery work,” he told the media, as per the Manchester Evening News. Paul Pogba will also return to the starting line up after missing out in Paris due to suspension, and so United will surely feel confident about their chances of picking up a positive result on Sunday. Martial’s return will be key given his pace, movement and eye for goal in the final third seemingly suits the style of play that Solskjaer wants to adopt, although Romelu Lukaku has made a strong case to stay in the XI too with his recent goalscoring form. Nevertheless, the midfield could be more important with the experience and dynamism that Matic and Herrera bring to the table, allowing Pogba to flourish too. 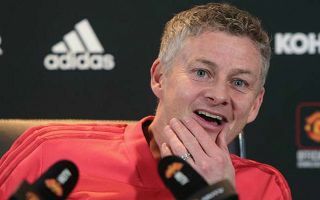 With that in mind, Solskjaer will hope that the pair can make their comeback against the Gunners.